One of my Facebook friends posted a link to a recipe for Three Cheese Italian Rigatoni Pie the other week. It was on a site called One Little Project. However this website credited another called Noble Pig for the original version which she tweaked. I was intrigued and began to explore more. In the end I found there were many versions of which, in my mind, bodes well. I ended up using the recipe from One Little Project with a few of my own tweaks. In looking at several different versions, the Ricotta seemed to vary from about 1/2 C to 1 C, with some going higher. I decided to try 1 C for my first attempt and that seemed about right. I also usually buy a package of ground meat slightly higher than they say as the men in my family are big meat lovers. I used about 1-1/4 lbs (approx. 525 grams). The finished pie wasn't that meaty. so I think the increase was a good one. One reason I chose this recipe as a start is that it uses your favourite spaghetti sauce - a great time saver on a busy night. Want to make it entirely from scratch? There are lots of alternative recipes out there including one I note at the bottom that uses both ground turkey instead of ground beef and a homemade sauce. It looks very promising. Perhaps I'll try it next time. 1. I measured to make sure I had a 9 inch spring form pan, but not all the rigatoni fit in it. I tried added as many as I could, but when the noodles are pushed too tightly together they collapse. As you have to spend a little time pushing the meat and ricotta layers down into the noodles, you probably want to have the pasta tops open a bit - not squeezed shut. I would go with the one pound suggested, but only fill until it looks like the example below. 2. The other note was my Ricotta was a bit runny, so a bit of liquid leaked out of the spring form. If your Ricotta is very thick, this probably won't be a problem, but it's always nice to be safe. I would suggest you place your filled spring form pan on a piece of foil in your oven just to be safe. Who likes to clean out an oven after something burns on? In the end - it was very tasty and easy to eat. You just put your fork in at the top pointing downward and a noodle or two peals away. It also makes for a nice presentation, is less messy to serve/eat and easy to know exact number of servings, but the taste really is just like a Spaghetti or Lasagna. Preheat the oven to 400 F. Grease a 9 inch spring form pan. Cook the Rigatoni in a large pot of salted, boiling water about 1 minute less than the package directions so it is still hard enough to stand up. Drain the pasta and rinse under cold water. 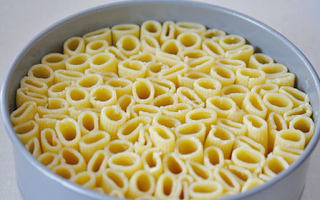 Toss pasta with 1 T of oil to prevent it from sticking. Then add the Parmesan cheese and toss until the cheese is evenly distributed. In a large frying pan, brown the ground beef in 1 T of oil until fully cooked. Drain off any fat. Add the pasta sauce and water and bring to a boil. Reduce heat. Simmer for at least 20 minutes. (I measured and had about 3 C sauce at the end, but if you use the recommended 1 lb. you will probably have approximately 2-1/2 C. Remove from heat and let it cool for 10 minutes. Mix together the Ricotta Cheese and egg. Set aside. Take the cooked rigatoni and stand each piece up on its end in the pan. Continue until the whole pan is tightly packed, but openings aren't squeezed shut. Spread the Ricotta mixture evenly over all the noodles. Spread the meat sauce evenly over the noodles. Use your finger to poke the meat and cheese mixture down into the noodles. The more patience you have with this step, the better it will be. This would be a great step for kids to help with. Bake for 15 minutes. Remove from the oven and top with the mozzarella cheese. Bake for another 15 minutes at 400F. Let stand for 10 minutes then run a knife around the edge of the pan to help remove the spring form pan. Slice and serve. You could offer extra heated spaghetti sauce on the side if you like. Another promising option I found was with ground turkey and homemade sauce at a site call Comfortable Food. I may be trying this one next. To view click HERE.